Another year is under way. It’ll be another week before classes are settled in our school, and so we engage in planning and activities to reconnect with former students and to learn a bit about new students. Having students create a classified ad / job posting for the sort of teacher they would like to “hire” is a quick activity that can be done with little preparation and results in some rather humourous responses (and sometimes less than subtle student requests for their preferred teacher). I typically engage students in a brainstorm, asking them to list 1) words that describe them, 2) things they like, and 3) things which are important to them. Words that describe them can range from physical descriptions (height, hair colour, eye colour…) to words that describe aspects of their personality (responsible, athletic, opinionated…). Things they like can include hobbies, activities, favourite foods, genres of books, and essentially anything they deem worthy of mentioning. Things which are important to them can include traits they appreciate in others, preferences for how things are arranged, and strong opinions about topics that matter to them. Once they have generated several examples in each dimension, I share with them the example of my posting for the type of students I would like to fill my class with – Seeking Ideal Students for Year Long Positions: Start Immediately. We isolate some examples of the aforementioned brainstorm categories, and students are provided with the instructions and the example to use as a model to create their own examples. Completed examples make for a great beginning of year bulletin board and outstanding examples are fun to include in newsletters to the school community or on school websites. The text is provided here for your reading pleasure as well as a word document at the end of this post, so you can edit and adjust for your scenario. I’ve done this activity with positive results in classes with students from Grade 4 – 7. Best wishes for a rewarding and productive school year. Draft a classified ad, advertising the kind of teacher you are seeking for this school year. You need to identify a number of things about yourself in order to make potential candidates willing to apply. Use the list of words that describe you, things you like, and things which are important to you to make your sentences. What types of things do you do well? Are there things you have difficulty with that applicants should be aware of? Energetic, adventurous teacher with great sense of humour seeks ambitious, enthusiastic students with positive attitudes. I am entering the twenty-first year of my teaching career. I’m 5’10, have dark hair, and blue eyes. I have a variety of interests and try to keep physically active. I enjoy escaping to a local mountain for a day of snowboarding fun. I enjoy soccer, kayaking, cycling, swimming, and camping. One of my favourite things about camping is telling stories around the campfire. I like to laugh often and try to make other people laugh by sharing funny stories. My favourite subjects are writing and P.E. I like to do jigsaw puzzles and love to colour, design, and create. I prefer action or suspense movies. I enjoy working with kids, traveling, and the company of my cats. I’m a vegetarian who is very selective about the foods I eat (and I don’t like different foods to touch each other on the plate). I’m looking for a number of students who will treat each other (and me) with respect, who will strive to achieve great things, and who like to laugh. I’m willing to work hard and to make learning enjoyable for open-minded, playful students interested in learning new things, and in working cooperatively to solve problems. I don’t expect perfection, but I do expect the best effort you are capable of. I’m willing to coordinate memorable field trips and to plan exciting lessons about interesting topics. I have plenty of energy and patience for students who ask for help. I hope to set a good example and I expect to learn as much from you as you learn from me in this coming year. I hope to inspire students to achieve and find success in the classroom and beyond. If you are the kind of student looking for a challenging, fun-filled year, who likes surprises, and can take a joke, please forward your application to Mr. Gidinski at Chaffey-Burke Elementary School. Deadline to apply: Thursday, Sept 10. As I take a break from drafting report cards, I’m relieved that I had students do this linked activity. It has become a bit of a fascinating process whereby I continue to learn about how students see themselves in relation to reporting. I did this with my class of Grade 6/7 students and in about 2/3 of the cases, I could use their self-reflective paragraphs, written in third person, as my final term report card comments. In the remaining cases, it leaves me with pieces that inform my drafting of their reports. This process has provided me with some relevant information about areas they might have experienced growth in that maybe I hadn’t had the chance to observe and with some descriptors of the types of students they view themselves as that I may not have considered. It is allowing me to incorporate some of their own sense of achievement during the year (or in the final term) into their report cards, honouring their perceptions of their own growth. The most fascinating response was a student who wrote a version of his report card paragraph that might be best described as “wishful thinking” or, in another way as “delusional.” However, he wrote a very critical and precise “worst case scenario” in which he critically identified some of his shortcomings. “Simon” is a well-organized, and hardworking kid who takes precise notes to record all work done in class. He is friendly and helpful to his classmates which helps build his leadership and communication skills. He participates actively in class discussions which improves his confidence. When he is part of group projects, others look to him for guidance. He is patient when listening to everyone’s point of view. He volunteers for a lot of school projects and extracurricular activities. He is a genuine, warm-hearted kid who loves to help people wherever he can. His work displays an effort to learn and improve. I could easily refute most of these comments with direct quotes from anecdotal comments I’ve collected throughout the year. While “Simon” is a hardworking kid, his grades fail to portray this fact. I find that he doesn’t ask enough questions in class to clarify what needs to be done on his assignments which leads to him getting a poor grade. I also find that “Simon” fails to think critically in his assignments and does not explain his points. I cannot understand them accurately. He also needs to improve his grammar skills. His work often comprises of run on sentences. If he wishes to achieve a better grade, he will have to improve on all of these things. I had to laugh at the accuracy and candidness of this passage, which is a much truer depiction of the student behaviours and tendencies I have observed, some of which we have conferenced about. Overall….fascinating sense of himself as a student. Looking for an activity to fill those last few hours of classroom time? Perhaps you’re looking for something for the beginning of the year. I like to use this as a vocabulary building strategy. It’s an activity that I refer to as The Synonym Continuum. It’s a list of synonyms for “big” and “small.” Students are asked to sequence them in order from the “smallest of the small” to the “biggest of the big.” It is intended to be an activity where they are actively looking up and confirming definitions for the words in order to compare their size, rather than just guessing at the order. One of my biggest frustrations with students using a thesaurus is that they tend to substitute a word they find without necessarily being aware of the connotation of the word they select. When I teach students to use a thesaurus, I typically teach them to use it simultaneously with a dictionary, so that they can be sure that they understand the word they are substituting and that it properly fits the context into which they are inserting it. The answer key that is provided in intended to be a reasonable but not definitive answer key. Definitions are included, but many of the words will have a range within which they fit, based on how their definitions are interpreted. Some definitions help to clearly position some as smaller or larger than others, while some remain a bit vague. Hopefully, your students will find this a relevant and meaningful activity and it will help them add some variety and sophistication to their descriptive writing. I’ve been putting off doing this for a while now. There have been plenty of excuses, lots of distractions, and a fair bit of procrastination in the meantime. There are a few things that have brought my attention back to this site, and particularly to the idea of blogging. One is that I’ve been really enjoying some of the writing products that have come out of the classroom activities we’ve been doing lately. (I teach a Grade 6/7 class this year – 18 boys, 10 girls). Another is the excitement building as I collaborate with a group of colleagues over upcoming Family Literacy Day celebrations we’re planning. And thirdly, I have a few speaking engagements on the horizon that I’m revising content for in anticipation of the conferences I will be attending in the next few months. I wanted to start off the blog with some profound declarations that would change the way people thought about writing instruction and about teaching boys. Every time I try to come up with something profound, I draw a blank. So I’ve abandoned that idea and decided that I’d just start the blog, see if there’s an audience for it, and follow where it leads me. If you’ve read this far, I hope you will consider joining the adventure and contribute to the conversation. I remember when I first started preparing to present my “Show! 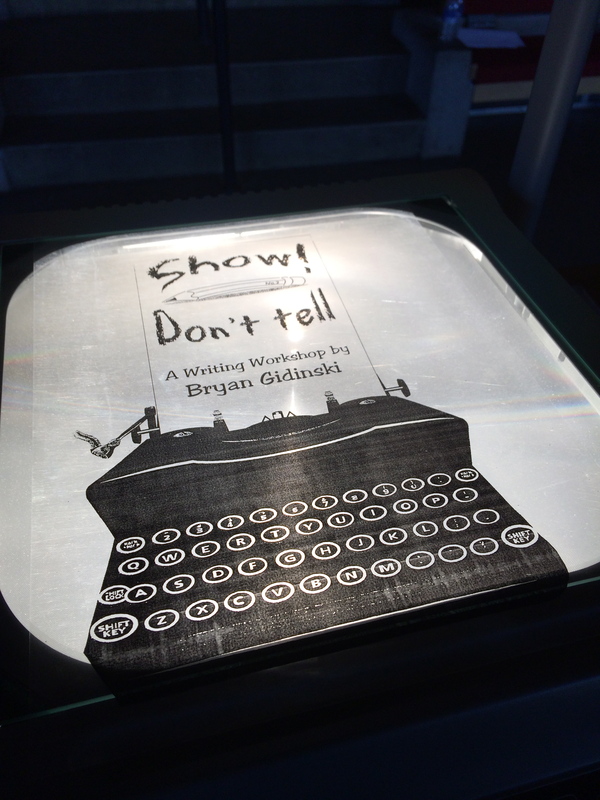 Don’t Tell” workshop, a workshop that has consistently gotten positive feedback and is really the foundation for all the writing workshops that I present. I remember the nervousness as I tried to determine what to include and how to address my audience. I worried that people would resent me for “telling them what to do.” It was early in my career, and I figured that more experienced teachers would reject and criticize my “unseasoned” advice. It wasn’t until I changed my thinking and decided that it wasn’t about giving advice, but rather about sharing the experiences I’d had and demonstrating the results that I had got with my students, that I could feel comfortable stepping into my role as a presenter. I will attempt to follow that philosophy as I share things here in this space. The intention is that it will be a place to share experiences (some of the triumphant ones as well as the frustrations). I’ll try to refer you to some of the resources that I have found influential (both in my curricular teaching and in meeting the needs of boys in today’s classrooms). I’ll try to make this a forum where people can question, share stories, collaborate, and commiserate over the challenges and celebrations that go along with this multifaceted job of being an educator. I provide the following for your consideration. It stems from a community night that we hosted at our school. We invited parents to come (with their students) and participate in what we referred to as a writing event. In conjunction with our school goals, we thought it was helpful to provide parents with some context and additional understandings about the kind of writing we were asking students to do in classrooms throughout the school. We felt it would be valuable in engaging parents as partners if we could establish some key understandings about writing. The following is what we hoped would set the context for conversations about writing. Engaging in conversations with your children about writing has the potential to profoundly influence their attitudes about writing and help them to develop their skills. Giving some specific and supportive feedback to a piece of writing can help them develop a willingness to revise and revisit what they have drafted and to participate meaningfully in the writing process. 1) If you can talk about it, you can write it. An important part of the writing process is the pre-writing process. Having your child talk about the topics they plan to write about helps to give them a foundation. If they have already thought about the topic, they are better able to transfer the ideas from “inside their heads” onto paper or into a computer. Asking specific questions can help them recall or invent details to make the writing more detailed and descriptive. Conversations, webs, or brainstorms can help a writer select a worthy topic to write about. Students who have difficulty writing can sketch pictures or storyboards of what they want to write about which can give them the foundation to then develop the description and action to enable them to write. 2) Writing is a very complex task. Writing is probably one of the most complicated, multi-tasking activities we ask children to do. It requires a writer to invent, process and organize thoughts inside his or her head, to transfer ideas on to paper, to recognize and apply proper spelling rules, to use proper punctuation and grammatical structures, to draft, organize and sequence information in text, and to be aware of the purpose and audience of the piece of writing they are drafting. Having children focus on one particular aspect (or a small, manageable set of aspects) allows them to really develop that particular skill without the task feeling overwhelming. This allows them to experience success in increments and, as they master some of the skills, they are better able to perform the necessary steps to complete powerful, informative pieces of text. 3) Writing is a process. One of the scariest objects for a writer is the blank page. It is important for students to be aware that getting content down is the key to developing a meaningful piece of writing. It is important to get ideas down. They can be extended, elaborated, reorganized, re-sequenced, re-invented later. Though spelling and punctuation are important, the emphasis on proper spelling and grammar shouldn’t be allowed to interfere with the process of outputting material and creating a draft that can be revisited. Typically, authors spend more time on pre-writing strategies or activities (i.e. planning what they will write about or developing an outline), and re-writing activities (editing, revising, proof-reading, checking for clarity) than in the actual writing of a piece. Just getting started can be a challenge….